Tired of loading and unloading moving vans? Intimidated by the idea of having to drive a huge truck through heavy traffic? Worry no more, because UNITS of the East Bay is here to meet your needs for portable storage in Fremont, CA. We deliver and transport a portable UNITS container to your door, and pick it up when you’re all done loading. We can deliver the fully-loaded UNITS container to any specified location in the San Francisco Bay Area, and we’ll do it while keeping your belongings safe and sound. UNITS makes your life stress-free, fast, convenient, and affordable. What have you got to risk? Call us today to inquire about portable storage in Fremont and the greater East Bay Area. We’ve been in the Fremont portable storage business for over two decades, so we know a thing or two about moving. We know the Bay Area like the back of our hand, so we can easily get to and from your old and new locations without getting lost along the way and causing you grief. And when you choose UNITS, you’re supporting a locally owned and operated moving company. 8 ft. by 12 ft.
8 ft. by 16 ft.
Each unit features E-Track straps so you can safely secure your belongings and prevent them from shifting around during transport. Our UNITS also have roofs that allow light in, so you don’t have to fumble around in the dark trying to get your belongings secure. We understand that safety is key when it comes to handing your items off to a moving company. That’s why we let you bring your own lock, so you know that only you have access to what is inside. UNITS are also stable during the entire moving process, including loading, unloading, and transit, so you won’t have to worry about your belongings shifting around or breaking. We deliver a portable UNITS container to whatever location you specify. You load the container. You load it at your own pace, and provide your own lock when you’re all finished. Contact us and we pick up the UNITS container. We drive the portable storage container to your specified location. You unload the UNITS container at your own pace, and we pick it up when you’re done. We also allow for month to month leasing of a UNITS container, either on your property or at our storage facility. Our warehouse is always staffed and secure, so you don’t have to worry about theft or tampering. Not sure when you’re moving? You can load up a UNITS container now, store it at our warehouse, and call us when you’re ready for it to be delivered. 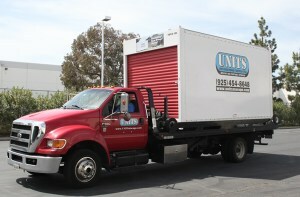 At UNITS of East Bay, we make moving easy. So the next time you’re in the market for portable storage in Fremont, call us!